In am embarrassed. My initial post, moments ago, spelled maintenance as “maintainance”! We’ve got to be able to make up our own words… that one sounds quite reasonable! Succinct, and yet it encompasses a lot of rhetoric, pros and cons, about the State vis-a-vis the tax-paying individual. Ingenious piece, really. ^_^ Thanks for sharing it. souless, thanks for the “ingenious”. I must tell you all, I wrote this thinking about the issue of paying taxes to kill people. It appears it also applies to the issue of taxes in general. 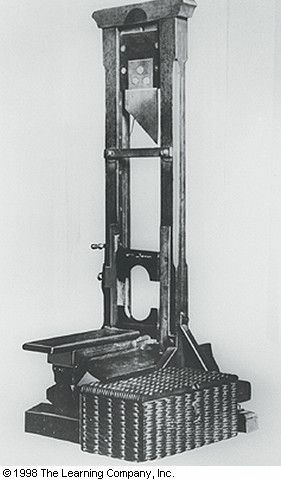 Yes, after I re-read it, and the guillotine image sunk in properly, I knew I hadn’t quite got what you were saying, about how our daily rounds are in aid of ultimately quite terrible activities by our so-called representatives. Congrats on your new (old) computer!